If you’ve followed the McDonald’s debacle for the past year you can’t have missed the fact that the company woke up late to the fact that consumer values had shifted. Away from fat/salty/fast/dollar-menu food to brands that were seen to offer healthier, fresher, natural, more customized food. And consumers were actually willing to pay more for that. You have to watch those values. They don't so much as sneak up on your brand as much as pounce. And today they move at the speed of a consumer hot-wired to their mobile device. Values often get missed on traditional research radar screens, and brands that miss them and are unprepared for those value-shifts generally end up with the short end of the balance sheet. Just like McDonald’s. The thing is, values aren’t cross-category generalizable so you can’t rely on what happens to some brand outside your category, you have to be on the watch for what’s specifically happening in your category. Sure, “trust” is part of every category, but what “trust” stands for in the pain relief category is vastly different than what “trust” means in the automotive category, and different from what it stands for in the smartphone category. Or the fast food category. Just saying, McDonalds. This all came to mind because June celebrated National Donut Day and National Jelly-Filled Donut Day, and a few people were surprised that in the face of value shifts to healthier food, donut sales have gone up – by about 7% YOY. 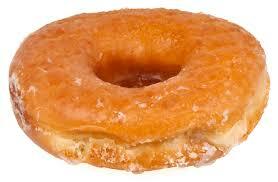 So health notwithstanding, Americans have ended up eating more than half a billion of donuts annually. Those health-related value shifts had great impact in the fast and fast-casual food category, but pretty much no influence for donuts. Because there’s a difference. Just because they’re both food, they’re really not the same, and values for each will be really different. Really. You don’t think about a hamburger in the same way you think about a donut. Sure, “taste” is in there, but a really different kind of taste. Have you ever had a donut that wasn’t tasty? Except a stale one, maybe. But what’s tastier than a fresh donut? Come on! You’re never eating a donut because you think it’s a healthy option. Be honest. The healthiest part of the donut is the hole. Now “variety,” there’s a value that resonates when you think about donuts. See? Category-specific. And those half billion donuts, sure a lot of them come from small bakeries and local pastry shops and corner food carts. But the majors – the Dunkin’s, Tim Hortons’, Krispy Kremes, the Daylights, Winchells, and Shipleys – all seem to be doing better and better. Which raises another issue – the one about how values have massively shifted in the how-and-what Americans eat for breakfast, currently to the detriment of cereal brands, and also in the way that donuts are no longer primarily viewed as a breakfast food. It all has to do with values. If you missed this month’s celebrations (those would be National Donut Day [June 5th] and National Jelly-Filled Donut Day [June 8th], never fear. There are others where you can join in later this year: National Cream-Filled Donut Day [September 14th], Buy A Doughnut Day [October 30th], and National Doughnut Day [November 5th]. Surprised there are some many days celebrating the donut? Well, just think of them as occasions to treat yourself and celebrate being smart enough to monitor and leverage all those category-specific values that can help your brand grow and prosper. And sticking with our theme we’d remind you that brand managers who don’t track and leverage values (no matter what category they operate in) end up with lower earnings and share prices. And usually a glazed expression on their face!